Heron Pointe comes with the conveniences of home including a full kitchen plus a washer and dryer in every condo. A short distance to the beach or relax in your choice of either the indoor pool or outdoor pool with sun deck. Heron Pointe is only a short distance from Ocean Annie's Bar and Grill, The Apache Fishing Pier, Tanger Outlets and Restaurant Row. This condo has many upgrades, flat screen TV's, granite countertops, hardwood flooring in living area and a great view. Imagine relaxing on the screened balcony sipping your favorite beverage or enjoying a great meal watching the native wildlife. There is a loft area with 2 twin beds and sleeper sofa. This condo is very spacious and directly off the elevator. 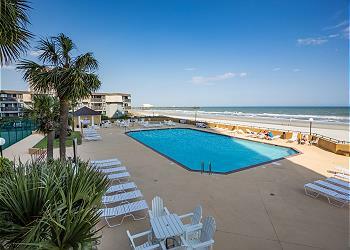 Heron Pointe is centrally located in the northern end of Myrtle Beach close to major attractions, shopping, dining, golf, plus much more. BBQ charcoal grill on site. I just wanted to send you an email to tell you how much we appreciated the house! It was absolutely beautiful and we had such a pleasant stay! We had one of the Carolina Panthers and his now fiancé (got engaged this past week-end at the beach) stay with us and they also stated how wonderful the house was! Thank you for all that you did - we are looking to come to the beach again in June for my son's high school graduation and will be contacting you only moving forward for a rental! Thank you again! We have enjoyed our stays over the past several years and plan on returning. The area is quiet, has a clean house, and is comfortable. Thank you.